The signature piece of Garfield Park Reservation days gone by. The current stone structure replaced a wooden bridge back in the 1930s when the Works Progress Administration (WPA) workers built this bridge that stands watch over Wolf Creek as it flows into Mill Creek. 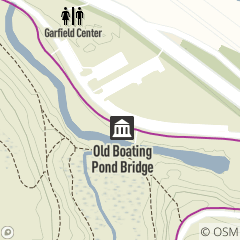 The current wetland area was once home to the Boating Pond where visitors in the early days of Garfield Park could rent rowboats.